True, inspiring and motivational thoughts from one of the Gods of creativity and industry…and yet these words may leave us feeling a sense of weight and sweatshop enslavement. We want to be busy in pursuit of productive endeavor, yes, but how do we transform the flavor of being busy to one of excitement and exploration vs. serious and heavy? I’ve noticed in my own growth toward expanding coaching services, delivering transformational programs, and growing brand awareness that there’s rarely the old gaps in between activities or big plays. Though not running a country or even a huge corporation, it causes one to wonder how to best keep playing big when being busy can start to wear on you. For myself, I see that what’s needed is a transformation in my relationship to “busy”. So, when clients are double booked, there could be excitement at having seen a hole for an upleveled system to implement vs. the self-judgement of having “messed up.” When there’s an ad campaign that spent good money with no results, there can be a jubilant “Hooray!” because we’re finding out what doesn’t work first (like Edison) vs. the woe-is-me marketing-loser feeling. Bringing the element of “play first” into the mix – where you only consider “learning experiences” vs. mistakes – is a good antidote to oppressed busy-ness. It provides the willingness to keep getting busier and playing fuller until things don’t work anymore…and learn and grow from the insights gained vs. pull back. When production starts to stretch the current systems — we miss scheduled appointments, the ordering systems fail, longer hours are required to fill demand — these are all good news and opportunities to level-up, system-up, and play-up. An attitude of gratitude for things starting to fall down on the job — vs. making ourselves or others wrong because things didn’t work “perfectly” — can support the “Bring it on!” thrill of growth. Where can you joyously thank your breakdowns today for leading to your breakthroughs tomorrow? If you are looking for some weekly inspiration to make your midlife experience completely radical, look no further! Today I’m launching a 10-week blog series titled, “Pro Tips for Winning Midlife”. Every Saturday morning I will be posting another “Pro Tip” for making your second half of life your best half. How often have you heard that “it’s all downhill from here” or that “your best years are behind you”? These seem to be common phrases associated with aging, and (sadly) many people just choose to accept these phrases as truths. 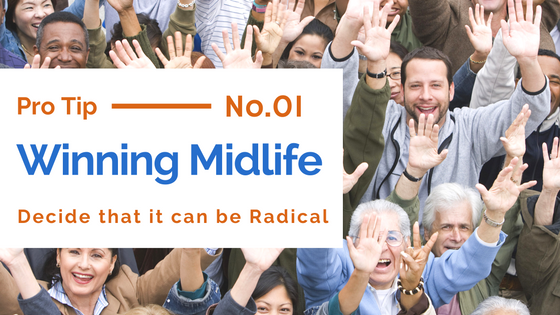 The first step towards winning midlife is to reject these statements and decide that your second half of life can be RADICAL, and LIFE-CHANGING, and OUTSTANDING! Step beyond the traditional idea that your next half of life will simply be an extension, magnification or shrinkage from your first half. Think of your first half of life as an enabling mechanism for what really matters (your second half of life)! What if it’s in the second half where our purpose for being on the planet gets fulfilled? You must believe that nothing before determines what is possible from here on out. 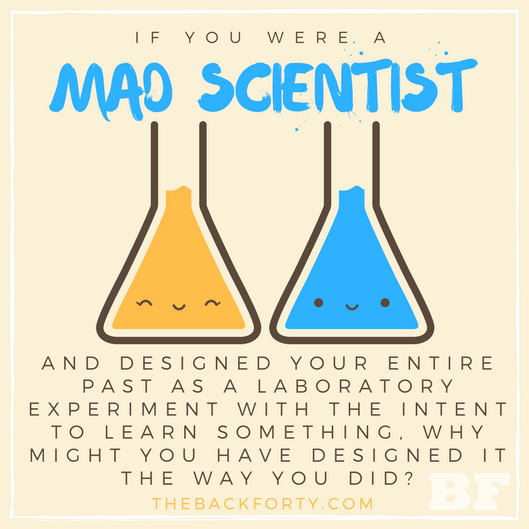 We often say that you have yet to do what you came here to do, and it’s true! You just have to take the first step and accept it. Come back next week for Pro Tip #2 and remember that your life can be radical! It’s amazing the amount of physical unconsciousness that can surround us in life…simply because of the wild card of “sentimentality” that we can often play. 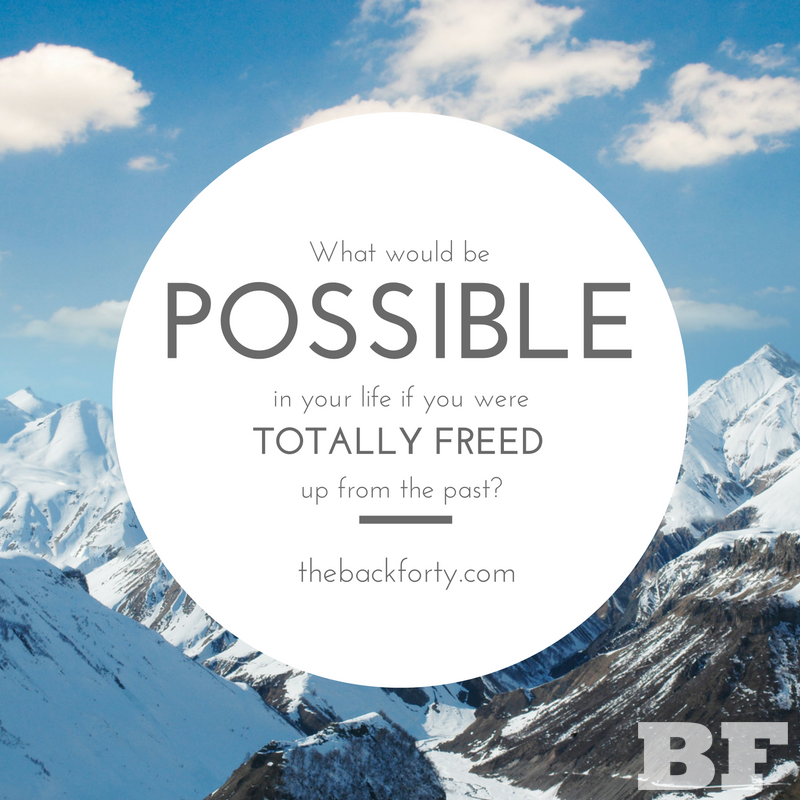 I can be grateful for both a partner coming into my life who leans toward the practical and dispassionate as well as a growing sense of what it will take to become a true Back Forty Freedom Flier. Whether my mother encouraged me to hold onto items because I might want to “look at them when I get old” or my father was the garage and shed black-hole filler does not determine my Big Game Back Forty Future…if I get and remain conscious. To live inside of the philosophy that “the best is yet to come and, babe, won’t it be fine” as well as the belief that “I have yet to do what I came here to do” means that my eyes, ears, environments, mind and heart must be forward-focused vs. rear-view-mirror fixed. Living in that paradigm requires being nimble, quick, light and bright…without the weight (physical, mental, emotional and spiritual) of past, past, past globbing onto me at every turn. I don’t need to watch 10 episodes of Hoarders or even to memorize and recite all passages of “The Japanese Art of Tidying Up” in order to awaken my need for Back Forty above-the-surface oxygen. These tools may serve to initially inspire me, but the critical and necessary ocular redirect toward what is in front of me (in life, purpose, passion, play) vs. what has taken place behind me is the key action to take. Dropping past-based ballast and replacing with future-focused environmental influences creates lightness and directional guidance. Exchanging the diploma for a dream board? Substituting an old picture with a graphic plan? Swapping a souvenir for a framed list of intentions? All are ways to detach from the lines so that our Back Forty Balloon can gain the altitude and attitude for a second half/best half impact. As Thanksgiving draws closer, thoughts of turkey and stuffing are beginning to fill our heads. For me, another dish that comes to mind is scalloped oysters. As I was growing up, my parents made scalloped oysters every year for Thanksgiving. Imagine my surprise when I realized that oysters were not a standard dish at everyone’s Thanksgiving table. So this year, I thought I would share my family’s tradition with all of you. Maybe I can even inspire you to bring something new to your family’s table this Thanksgiving!